The Object D was conceived as a multi-functional science laboratory with an ambitious array of instruments onboard. It was expected to measure the density and ion composition of the Earth's atmosphere and its magnetic field, and to study solar radiation and cosmic rays. The first satellite also promised a wealth of engineering data, which could later help in the development of attitude- and thermal control systems for future spacecraft, as well as information on the interaction of satellites with the upper atmosphere. 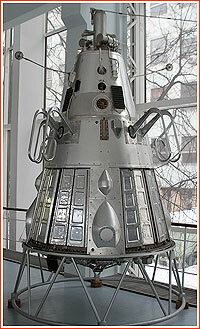 The spacecraft's mass was limited to between 1,000 and 1,400 kilograms to match the capabilities of the R-7. 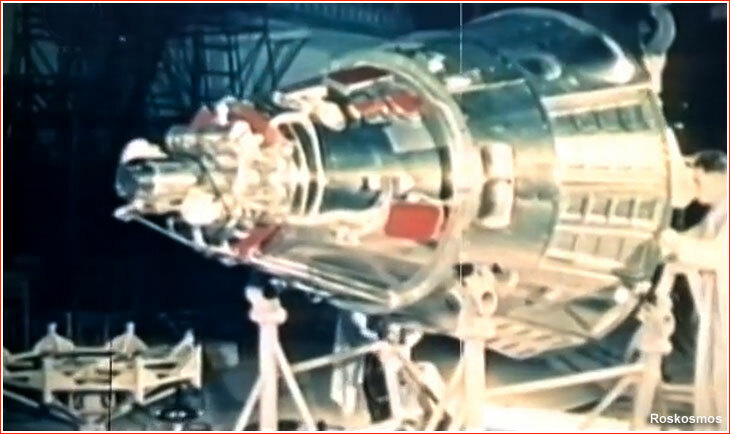 The total mass of scientific equipment onboard the satellite could reach up to 200 or 300 kilograms and the launch was planned in 1957. (248, 52, 126) Unlike the wording in an early draft of that government decree, the launch in the first half of 1957 was no longer specified. The document authorized the use of hardware and components developed for "other articles," (likely meaning nuclear warheads) in the Object D project in order to save time and resources, as long as it would not interfere with the work on the original vehicles. In addition to the full-scale development and manufacturing of Object D, the same decree also authorized preliminary studies into Object OD, where "O" stood for "orientiruemy" meaning capable of controlling its attitude. Technical requirements for the OD vehicle were to be jointly formulated by the Ministry of Defense Industry, the Ministry of Defense and the Academy of Sciences. This project formed the foundation for the development of a vehicle which could be returned from orbit, thus paving the way to the first manned spacecraft. "I would like you to know about still another project." As he noticed that that his visitors were about to leave, Korolev added quickly: "It will only become feasible with the birth of the R-7. I wrote a report about it to the Central Committee and have had a positive response." "Sergei Pavlovich (Korolev) led us to a stand occupying a modest place in a corner, near the door. 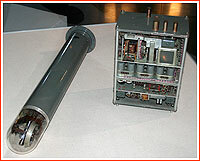 A model of some kind of apparatus lay on the stand. It looked unusual to put it mildly. A flying machine should have a smooth surface, flowing shapes and clean-cut angles. But this one had some type of rods protruding on all sides and paneling by projections." 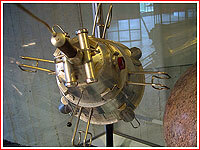 Korolev began his exposition far back, with Tsiolkovsky. He recalled the latter's dream of escaping the bonds of Earth. 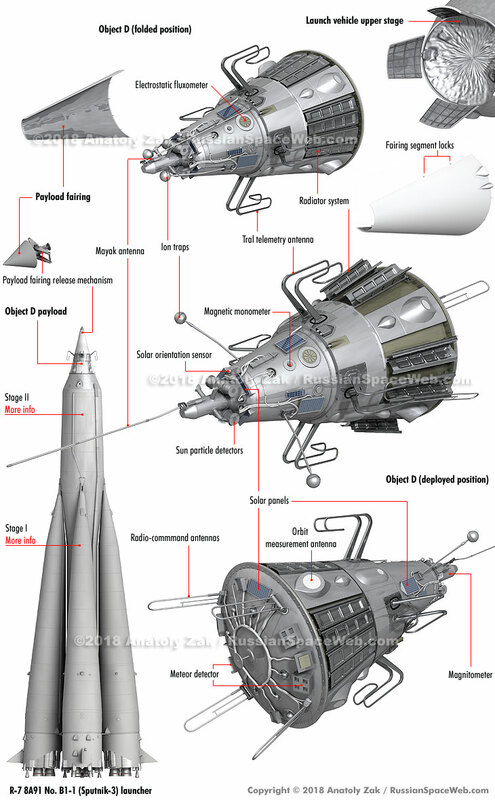 The first technical requirements for the satellite were issued in February 1956 (247) and on June 14, Korolev finalized a list of modifications needed to be implemented to the R-7 rocket in order for it to carry Object D into orbit. The spacecraft would have a full complement of hardware for its interaction with ground control. 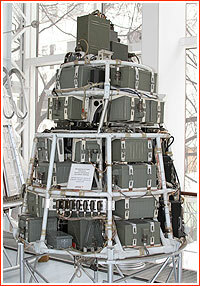 It included avionics to generate and transmit telemetry, a Fakel receiver and transmitter, providing tracking signals to the Binokl-D radar stations on the ground, a transmitter for the Irtysh-D trajectory measurement stations and hardware for the MRV-2M command system. (270) It would enable ground control to turn on and off scientific instruments and service systems aboard the satellite. Four small solar panels were installed on top of the satellite, another four on its sides and one was attached to the aft bulkhead. Korolev made sure that Mikhail Tikhonravov, the chief "ideologist" of the satellite project and his personal friend, played a key role in the upcoming development of the spacecraft. On Oct. 3, 1956, Korolev requested Ustinov to transfer Tikhonravov to OKB-1 to work at Department 9. On Dec. 27, 1956, the same request went to Marshall of Artillery Mitrofan Nedelin. (247, 248) It was eventually approved. Department 9 was led by S. S. Kryukov with Tikhonravov as a scientific consultant. 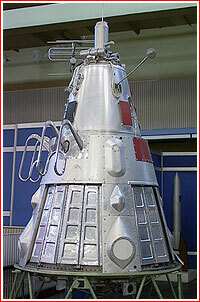 According to Korolev's biographer Yaroslav Golovanov, Tikhonravov was working at OKB-1 as of Nov. 1, 1956. 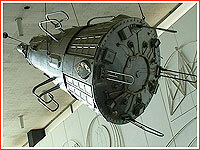 (18) Tikhonravov took charge of the preliminary design of the future satellite.